So my run commuting has so far been a triumph. I run great times (mostly because I’m worried about getting to work on time), I’m saving my bus money (to spend on more running gear) and I don’t feel guilty about spending time on my running obsession. After my first few run-commutes I decided I needed a better backpack. 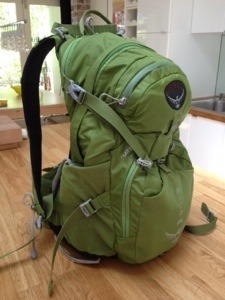 What I wanted was a lightweight pack, comfortable for running with, able to be used as a general work backpack when not running, and big enough for a day pack when out with my kids. I wanted an all-round bag as I didn’t have the budget for buying a few single-purpose bags. After a month of extensive research, I decided to buy the Osprey Mira 26. So far, I have nothing critical to say about this pack. I have used it on runs between 5k and 12k and it hasn’t let me down yet. The Osprey Mira is really lightweight and easy to run with. It has a mesh panel to stop sweat reaching the bag, and easily adjusted straps, chest belt and waist belt. For longer runs, I pop in the hydration bladder which holds 3L and is easily held in place by a magnet on the chest strap. There are plenty of pockets, a rain cover, key clip, places for kids’ drink bottles and easily accessed pockets on the waist belt for my phone. I can easily fit all my running gear in it on my way home, plus a laptop or iPad. Some reviews claimed that the trekking pole looped rubbed their arm, but I haven’t had that problem. I would strongly recommend this pack for anyone looking for a running pack. It’s made my running so much easier. DISCLAIMER: I was not given this product or paid to review this product. I paid for this with my own money and these are my own opinions. I’ve had this bag for 3 years now and still use it. 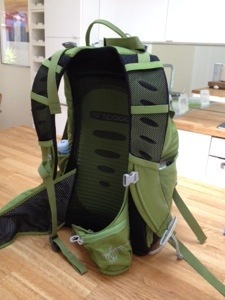 Now I run longer distances, I use a Salomon hydration pack for longer distances (review to follow soon). This bag is still great for my run-commute to work twice a week. It holds usually holds my jumper (when I leave home on the 3 degree mornings and warm up as I run), water, keys and my wallet. It’s turned out to be a great pack for going bushwalking with the kids too as I can hold plenty of water for all of us, a couple of jumpers and our lunch boxes. It’s still comfortable to run in and great for taking as my carry-on luggage on planes. I’ve been so happy with this bag I’m thinking of getting myself an Osprey suitcase for our next adventure… but more on that in a future post.